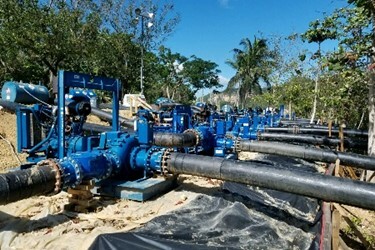 More than five months after Hurricane Maria decimated Puerto Rico, local company Thompson Pump and its workers are still on the island helping citizens recover from the aftermath of the worst storm in the country’s history. Thompson Pump’s tireless efforts helped save an entire community from a potentially catastrophic flood and provided safe drinking water to more than 200,000 citizens. Hurricane Maria’s sustained winds of more than 150 mph and 30-plus inches of rain left behind a shocking path of destruction. In the immediate aftermath of the storm, Thompson Pump was among the companies contacted to place bids on a relief contract from the United States Army Corps of Engineers. Thompson subsequently was given the go-ahead by the government agency and immediately mobilized a team of workers, traveling to Puerto Rico to formulate a strategy to help save a large community of residents living downstream from the Guajataca Dam. Thompson Pump, a 48-year old family-owned company based in Port Orange, Florida, is a full-service manufacturer and provider of high-quality dewatering pumps, pumping equipment and engineering expertise for dewatering, bypass, and emergency pumping applications worldwide. For more information, visit www.thompsonpump.com.